Buying a house is a matter of pride in every Indian household. There’s a lot of sentiment attached to it and it also is a big factor influencing one’s social status in the neighborhood. However, real estate prices have over the years seen an upward spike and so have interest rates on loans. This has led a lot of people to evaluate whether they should rent a property or buy one. Here are a few points to consider before deciding whether ownership or renting makes greater sense for you. Relocation: If you are a person who is in a job that involves relocating to a new place within a small span of time. It would always be prudent to rent a home rather than buy one. Buying a property ties you up to a select location whereas renting can enable you to be flexible and even move to places that are close to your work location. Career & Income insecurity: If you are unsure of whether or not your current job will last as long as you expect it to, then buying a property shouldn’t be on your wish-list. In the current scenario properties are often purchased by taking loans from banks. These loans generally span to about 20 years and the fact that you will have to pay your EMI’s for the mentioned period demands you to have a steady and secure career/income. Credit history: Home/property loan approvals are largely based on your credit history. If you have had past loans where you have defaulted more than few times on your monthly dues then your credit history would have taken a hit. People with poor credit history have to shell out more than the usual margin of 20% of the value of the property as down payment while availing a home loan. This for a middle class family should be an important food for thought in deciding whether to rent or buy a property. Low Maintenance Costs: When renting a house, you will not have to worry about the maintenance costs associated with it. Pipe leaks, need for painting the walls etc. are expenses that a house owner has to deal with and frankly maintaining a house can be pretty expensive in today’s scenario. Equity: This is undoubtedly one of the main reasons why you must buy a property when you can. It is a common notion that the EMIs that you will pay for the next 5-10 years for purchasing the home will be equalized by the increase in the value of the property over that particular period of time. The capital appreciation of a property is very high and is one of the most recommended investment choices alongside gold and mutual funds. Tax deductions: Properties that have been purchased on home loans are eligible for tax deductions for principal amount paid up to 1.5 lakhs and interest rates up to 2 lakhs. This can help to considerably lower your tax outgo, irrespective of the tax bracket you fall under. Creative Freedom: Unlike a rented house, you as a home owner can do probably anything you want with your house. Creative control is something that every house owner enjoys. Be it painting the walls with your favorite colors or wanting to display pictures on the wall that have for so long stayed locked, owning a house allows everything. 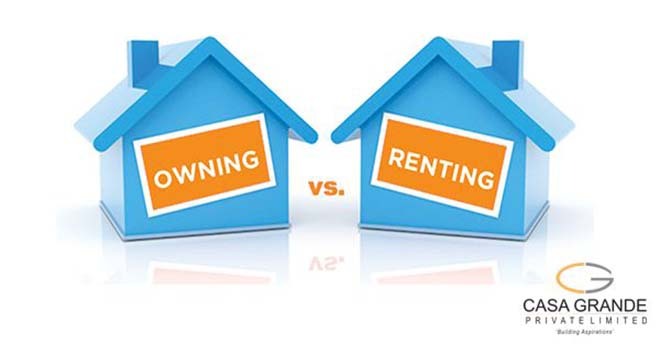 While both renting and owning has its own pros and cons, the cost effectiveness of both these activities depends largely on the market that you are currently in. At the end of the day you will have to weigh in all the factors mentioned above and conclusively make that big decision.